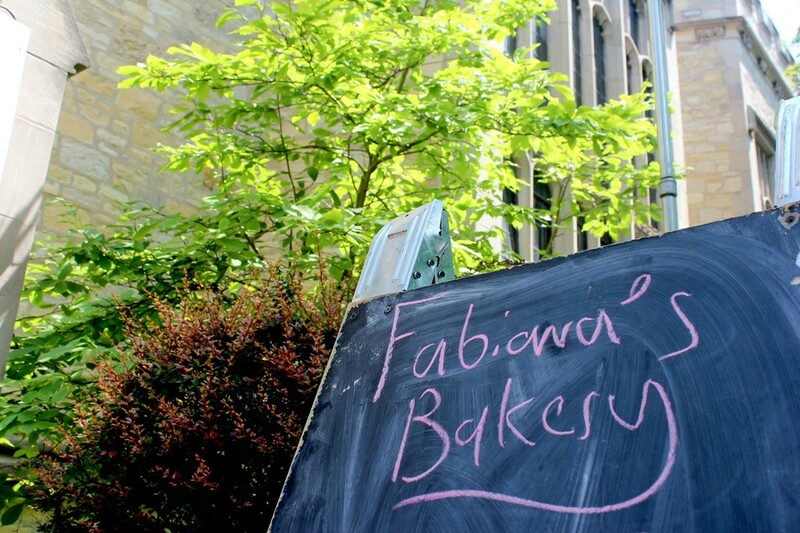 Chalkboard sign outside Fabiana's Bakery. 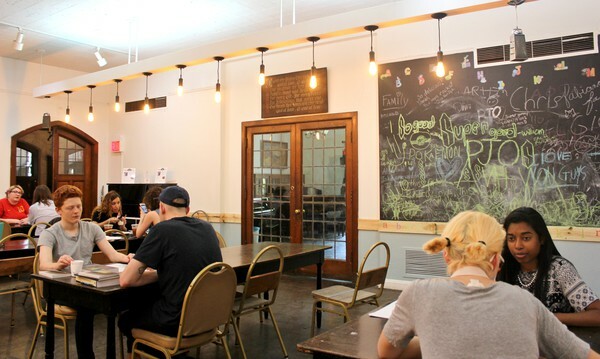 Located at 5655 South University Avenue is an unexpected blessing inside the University Church—a bakery. 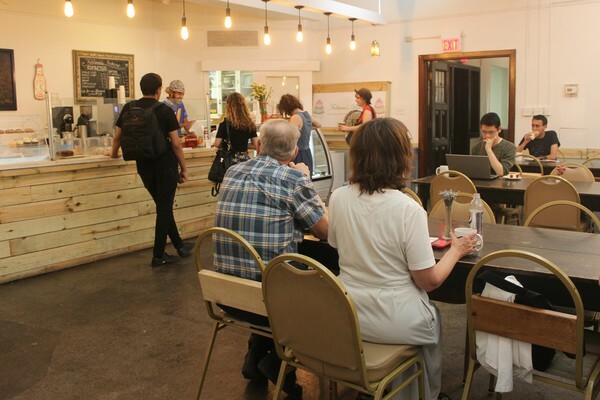 The highly sought-after Fabiana’s Bakery opened last September and offers a variety of food and beverages, including pizza, sandwiches, coffee, and tea. Perhaps the most popular items, however, are the pastries and baked goods. Fabiana Carter started her business in the kitchen of her Chicago home prior to opening the café. The Brazilian, self-taught baker grew up in an Italian household, where she says that cooking was a big priority. Carter believes that her mixed roots and experience as a current Hyde Park resident inspire her desserts. On Tuesday, she sat down with The Maroon to discuss her move to Chicago, her business, and her favorite desserts. Chicago Maroon (CM): How long have you been in Chicago? How did you get here? Fabiana Carter (FC): Four years. I used to live in London for seven years, and I met my husband in London. He’s from Chicago and always wanted to come back, so we ended up here again. CM: How did you get the idea of opening a bakery? FC: I always baked, and when I was doing that from home, I was making cakes for weddings and birthdays. Even in my free time, I was always making pastries, and we’d give them to people to try, like my neighbors and my friends. And then somebody was like, “Why don’t you open a business? You’re so good at it.” So then I talked to my husband and he said, “You should definitely do it.” Then, we started pursuing locations and pulling everything together. CM: How long have you had the bakery, and how did you find the space? FC: I have been working as a baker for a total of three years. I was at home, and then we moved to this space last September. We are members of the church. CM: Do you own any other businesses, and if not, have you ever considered opening anymore? FC: I don’t own any other businesses, but my husband is very business-oriented, so he’s always looking to expand. We actually want to expand to Pilsen, and we have two other locations that we are working on expanding to next year. The Pilsen location is also in a church, and we are still working to get the building, but my husband is overseeing the business side of it. We hope that in another year, we’ll have that location and a bigger kitchen so we can provide even more. CM: How is your business different from others in Hyde Park? FC: We are the only bakery, actually, because we have others like the Medici’s, and they have a few pastries, but more American food. And I think it’s also different because I’m Brazilian and I sell Brazilian pastries, and everything is made from scratch. That’s something that I think really brings people in. I feel like sometimes, nowadays, food is so processed, so it’s really nice to go to a place where you know you’re going to have a homemade meal or pastry. We order local produce from Hyde Park Produce, and we love them. CM: What’s a day at the bakery like for you and your team? What has been your busiest time since you opened? FC: Well, it’s really crazy. We don’t stop. We start at five o’clock in the mornings and are sometimes here until nine o’clock at night. Like on Monday, I think I had seven orders of cake in one day. On the weekends, it’s really crazy. On Saturdays, we have orders all day. We’ll have 10 to 15 cakes to make, which is really nice. It’s nice to know that people are coming to the bakery and that they enjoy what they eat. That’s so fulfilling for me. And we’ve grown so much since we started, which is awesome. So far, I can tell you that Easter, Christmas, and holiday times were very busy. In terms of working in the bakery every day, we are always busy. CM: What’s the most common thing that your customers order? FC: The cinnamon rolls are famous. People love them. And the Brazilian chocolate cake is something they request a lot. And the roulade is really good. It’s a pizza dough with filling. If you haven’t tried it yet, you should! We always have different fillings. And of course, there are our cakes that we have in the case. We always have about five of them, and they really sell out. CM: Are you doing anything new for the summer? FC: We just set some tables and chairs outside, and it’s really nice because it’s under the shade. I’m also working on having smoothies too, and also a variety of other things. Author’s note: I tried Fabiana’s for the first time two weeks ago, after having a rough day. The bakery is gorgeously decorated, and the staff are all friendly. Being there lifted my mood immediately. I highly recommend the chocolate bundt cake, the strawberry cake, and the apple pie—which is all I’ve tried so far. This place is definitely the icing on the cake at UChicago!